Disulfide bridges can be disrupted by treating a protein with 2-mercaptoethanol (HS-CH2-CHOH). The bond between the two sulfurs in the protein is broken and a new bond is created between two sulfurs at the end of two molecules of 2-mercaptoethanol. (2-mercaptoethanol used to be called β-mercaptoethanol or βME.) Treatment with 2-mercaptoethanol is now standard procedure for denaturing proteins. For example, 2ME is always included when proteins are prepared for SDS polyacrylamide gel electrophoresis. Anfinsen wanted to show that the information for protein folding resided entirely within the amino acid sequence of the protein. 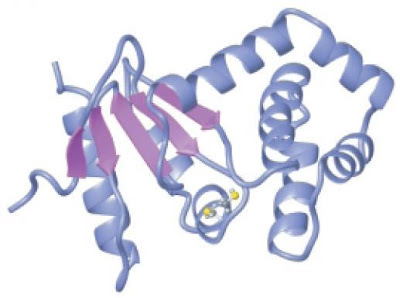 He choose ribonuclease A as his model for folding but he couldn't completely denature the protein unless he treated it with the denaturant urea plus 2ME to break the disulfide bridges. Under those conditions, the protein unfolded. It would refold spontaneously once he removed urea and 2ME from the folding solution. 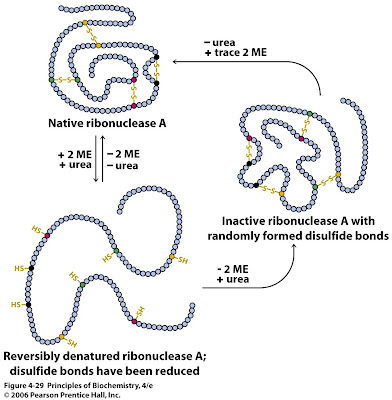 Ribonuclease A regained biological activity under those conditions. This demonstrated that refolding could take place in vitro. Anfinsen discovered that removing 2ME but not urea led to recovery of 1% of the activity. This is attributed to the formation of random disulfide bridges between the 8 cysteines present in the protein. There are 105 different possibilities (7x5x3x1) so the 1% recovery makes sense. It also shows that the correct three-dimensional conformation must be achieved fairly rapidly when urea is removed since most of the protein under those conditions becomes active. However, recovery is not 100%. Mistakes are made in vitro and presumably in vivo as well. This led to the discovery of an enzyme called protein disulfide isomerase (PDI)—an enzyme that catalyzes reduction of incorrect disulfide bonds and allows a protein trapped in an incorrect conformation to unfold and try again. The enzyme preferentially recognizes incorrect disulfide bridges since these tend to be exposed on the surface of the misfolded protein, whereas correct disulfide bridges are usually buried in the hydrophobic interior of the correctly folded protein. I am a novice at the subject of genetics, but I have been looking into this particular experiment, and I am wondering if I am understanding it properly. When Anfinsen removed the agents, he did so in two different orders. First, he removed the mercaptoethanol and then the urea, which resulted in less than 1% of the original activity. Second, he removed the urea first, and then the mercaptoethanol, and almost all the initial function was regained. I have been going back and forth with the reason for the differences and why the order of removal made such a difference. 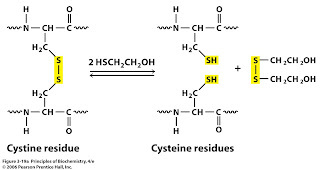 Was the first attempt unsuccessful because removing the mercaptoethanol caused the S-S to form back, but since the protein was still denatured by the urea, the sequence in which the cysteines bonded was different than it originally was, and in changing the original sequence the protein lost it’s ability to function? Yes, that's correct. In the presence of urea the protein was unfolded and it could adopt any number of conformations. In some of these random conformations there were two cysteine residues that were close together and a disulfide bridge formed between them. This locked the polypeptide into a misfolded structure with no activity. If you remove the urea, the protein folds rapidly into the proper three-dimensional structure. The "correct" disulfide bridges then form between the cysteine residues that are adjacent in the correctly folded structure. This locks in the three-dimensional structure and prevents it from unfolding in the harsh conditions outside the cell. have there been similiar experiments done to prove this again? any follow ups or such? I don't know for sure that these experiments have been repeated with other proteins but I assume they have. In any case, the result is so obvious now that nobody questions it. Very few of the proteins produced in the cytoplasm of a cell will have disulfide bridges. It's not a common feature of most proteins. Sorry, I know this thread is old but I just discovered this blog. Isn't this idea what's often referred to as the central dogma of protein folding? What's the current thinking on this principle? Right, so in the prescence of urea the protein folds incorrectly and hence has dimished activity (relative to its original activity). What I don't understand here is why the protein folds correctly in the prescnece of 2ME. Surely 2ME also causes the disruption of protein structure? So how does it correctly spontaneously fold in the prescence of 2ME? Thanks for your great blog post. I am currently studying for my PhD qualifying exam and this is a great explanation of this experiment. If I may answer Rick's question, to help solidify this idea for me: Protein folding is driven by multiple forces. One of these is the hydrophobic effect, which in order to reduce the total entropy of the system, will drive the protein's hydrophobic residues (such as valine and leucine) to cluster in the inner core of the protein away from the aqueous solution. This clustering of hydrophobic residues in the inside of the protein helps the protein to fold correctly. Most denaturants like urea and guanidine hydrochloride will reduce the entropic gain that results from this tendency--this results in denaturation of the protein. 2-ME, on the other hand, doesn't lead to denaturation in this way, instead, it just reduces disulfide bonds. By adding a denaturant like urea, and a reducing agent, like 2-ME, you are causing the protein to become unfolded in two distinct ways. Also, I believe that another key part of this experiment is that in order to allow the protein to re-fold correctly, you are only adding TRACE amounts of 2-ME--thus disrupting all but the most energetically favorable disulfide bonds that are present in the native conformation. Other, less favorable disulfide bonds will be disrupted by the low concentration of 2-ME. Hope that makes a little sense! regarding the last comment posted.. now i have a better idea why 2-mercaptoethanol was added during refolding.. but is there a variation of the experiment that could work without the need to add small amounts of 2-mercaptoethanol? 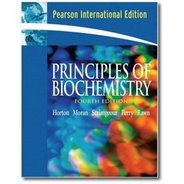 Its very informative blog for people like me who want to understand proteins. I have a small unclarity in my mind. According to the above experiment (if i got it correct), can we speak that disulphide bond formation is a consequence of protein folding not vice versa and if yes, hence play no role in process of folding of ribonuclease (as S-S bond should be formed after folding has occurred, what i could infer from the experiment). Yes, disulfide bond formation is a *consequence* of folding and not a driving force. Most proteins don't have disulfide bonds and they fold just fine without them. The disulfide bonds stabilize the correctly folded protein so that they don't unfold in harsh conditions. Unfortunately, disulfide bonds also stabilize *incorrectly* folded proteins and that's a problem. I am new on this site. But would, please, help with this question about the Alfinsin's experiment. Why did Alfinsin chose RNaseA instead of trypsin? I think that RNase is less expensive than Trypsin. Is that right? "I came here looking for more information, as I was presented with a slide in one of my lectures about the topic...in BCH210 at UofT. Small world :)"
If protein folding is reversible and requires no energy, why doesnt a boiled egg unboil when you cool it? sorry if it seems like a stupid question. "Anfinsen's dogma (also known as the thermodynamic hypothesis) is a postulate in molecular biology championed by the Nobel Prize Laureate Christian B. Anfinsen. The dogma states that, at least for small globular proteins, the native structure is determined only by the protein's amino acid sequence." How is the folding of larger proteins explained? "In molecular biology, chaperones are proteins that assist the non-covalent folding or unfolding and the assembly or disassembly of other macromolecular structures,"
I assume these "chaperone" proteins are produced from coding DNA. Or are they produced from non-coding DNA? I found this blog quite interesting. as Ashar pointed out that the protein no longer retain primary sequence at that temperature. But how would you think that the proteins from thermophilic organisms exists, there are many theories regarding them that it has extensive salt bridges which keeps them stable. but still how can the main chain stability be retained if it was to breakdown at high temperature? there are organisms which survive at 105 deg C.
And regarding the disulphide bonds, I am working on a protein which has 7 disulphide bonds, the purification step involves refolding, but I am unable to get a stably folded protein, which I think because I am not able to crystallize it (Its has already been crystallized which I am not able to reproduce). So I am attributing the problem to non-native disulphides. Any suggestions? This is good, well discussed post. But i do have a very basic doubt regarding. How at all from this experiment we can clearly say that, protein folding is driven by SEQUENCE of amino acids. Pls help m ot understand this. This is a great explanation of the Anfinsen Experiment. I'm disappointed that I transferred away from UToronto to the University of Michigan before I was able to take a class with you. This is a very helpful post Mr. Moran. Nonetheless, I want to know how the "info for protein folding resided ENTIRELY w/in the amino acid sequence". Is this related to what kikkidRU said: "the sequence in which the cysteines bonded was different than it originally was, and in changing the original sequence the protein lost it’s ability to function" (which relates more to bonds than a sequence itself). From here is the sequence described by kikkidRU the same as what Anfinsen referred to as the amino acid sequence? I'm confused. Isn't the amino acid sequence not changed whether or not the protein is folded or unfolded? So how can info on folding be derived from it? Or again, was the folding described by the bonds that form within the protein? Also, another question; how did Anfinsen's experiment helped in the discovery of PDI. I see the connection within the likeness of 2ME with PDI, but how was this discovered with the help of Anfinsen. when Anfinsen did his experiment, Refolding of Rnase A in vitro it takes hours but in vivo no more than minutes usually seconds. so from this we can conclude that there must be another way to catalyze formation of the correct disulfide bond in vivo, which led to the discovery of PDI. Do all proteins refold spontaneously when PDI is added? In the presence of PDI in almost all proteins, the protein get catalysed to fold spontaneously! Ofcourse, PDI aid in disulphide linkage thus hydrophobic interaction, letting protein to fold ! PDI also largely help in misfolding of proteins and thus check it. I appreciate this post...even though I am MANY years late to the party. I have heard that those who show up late shouldn't ask questions, but I can help it...this is one of my favorite subjects. If protein folding is spontaneous and dictated by only the primary sequence, why are nascently synthesized polypeptides aided by chaperones in vivo? Not the one's in response to heat shock which respond to local unfolding, but the constitutively expressed chaperones like HSC70. Although the free energy change dictates that the equilibrium greatly favors the correctly folded protein there's no guarantee that a given polypeptide will fold quickly enough. Chaperones, like traditional enzymes, don't change the end point of the reaction - they speed up the process so the equilibrium is reached more quickly. It's a kinetic problem not a thermodynamic one. In some cases, the rate of folding is slow because the polypeptides get stuck for a while in a misfolded state with a deep energy well. They could even form aggregates. Chaperones help prevent that or reverse it. conservation of space (since the cell is dense) and the prevention of misfolding are good starting points, but proteins fold quickly (relatively) without the aid of chaperones and the space saving qualities dont seem to do chaperones justice. Maybe i'm way out in left field...but that's my naive observation. I realize that I too am very late to this blog, but I have been thinking about this experiment a lot. I understand that non-covalent bonds must form first in order for the correct disulfide bonds to form, but how can we be sure that once the urea is removed, the protein folds into the complete final shape and that disulfide bonds are only a consequence of folding? Is it possible that only parts of the protein fold into a well-defined shape when the urea is removed and that there are still partially unfolded regions of the protein, which could lead to considerable flexibility and the possibility of different conformations within those regions until disulfide bonds are formed? If so, although the formation of disulfide bonds is still a consequence of the non-covalent bonds formed once urea is removed, wouldn’t they have some role in determining the overall shape of the protein? Obviously if the non-covalent bonds formed once urea is removed completely reduce any ability of the protein to move around in response to random motion by the molecules surrounding it and thus assume different conformations, the disulfide bonds would only be a consequence. However, I am not sure how we can be 100% convinced that there is no possibility of the ability for regions of the protein to assume different conformations after the urea is removed other than by considering the fact that most proteins do not have disulfide bonds.